Sony has revealed a Call of Duty: WW2 edition of the PlayStation 4 and it’s pretty hideous looking. 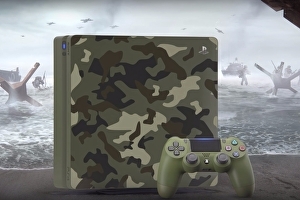 The green camo console was announced via the official PlayStation blog and is part of a Limited Edition Call of Duty: WW2 PlayStation 4 Bundle. The bundle also comes with a matching green controller and a physical copy of Call of Duty: WW2. Unfortunately no amount of camouflage can hide this monstrosity. You can check out the camouflage console below, if you can see it.